Confession: I used to think "How Do You Like Me Now?" was a Franz Ferdinand song, and that made me like FF better. But the song that's everywhere and used in everything (because of the rare universal truth that it's a great song, not just a song we're conditioned to think is great but is actually shite) is actually by the Heavy. At the festival, my education in the English neo-soul band culminated in one of the best Bumbershoot sets in years. 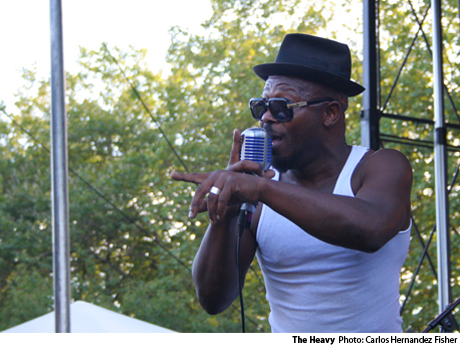 Lead singer Kelvin Swaby struts, swaggers and swings his arms around like a pro. His charisma is so all-consuming, we need to hope he continues to use his powers for good as a master in audience participation: we howled like wolves ("Big Bad Wolf"), communed with the devil ("Sixteen") and call-and-answered "What Makes a Good Man?" The fan club forms behind me.